Warning to all letterboxers: Don't look at the pictures in this post, unless you want to spoil all the fun! Letterboxers, look and read further at your own risk. That is my disclaimer. Do you have no idea what I'm talking about? Well then, it's probably okay to continue reading. So I have recently gotten into the 'sport' of letterboxing. It is very similar to geocaching, which most people know about. 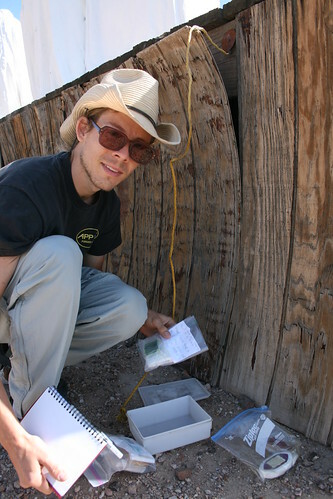 In geocaching, people leave small boxes or packages at certain GPS locations. You need a GPS or some kind of map to find the location as best as you can, and then you start looking for the hidden geocache. Inside of the geocache are some trinkets, which you can take, but you must also leave something too, I think. Letterboxing is very similar, but in my opinion much better! Finding a well hidden and fun letterbox in the historic Austin, NV cemetery. 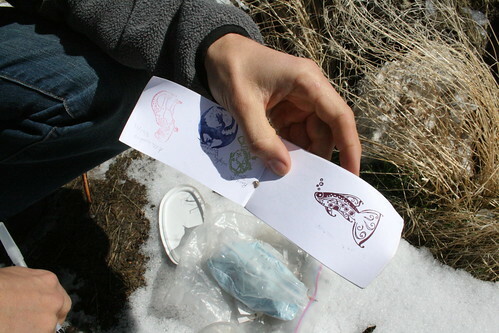 With letterboxing, there is also a small box or baggie that is hidden in the elements. But you don't find it with GPS coordinates. Instead, you get clues which you follow to the exact location of the letterbox. The clues can be in any form, very direct or cerebral, like a puzzle. They can be words, or pictures, or even in a code that you have to decipher! Anyways, once you get the clues (which are posted in the U.S. at AtlasQuest or Letterboxing North America) then you start hunting down the letterboxes. Its amazing how many are hidden in just about every city, or park. There are hundreds of them in Oakland alone! 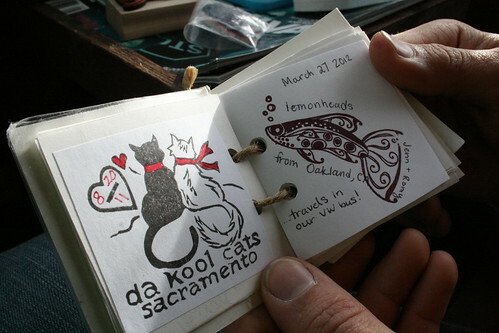 Putting our stamp in the stamp book (ours is the fish, and our alias is Lemonheads). 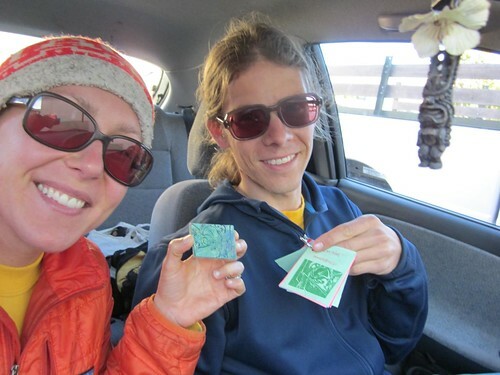 To start letterboxing, you need a small personal log book and an ink pad, and your own personal stamp (although that is technically not necessary). Inside each letterbox, you should find a unique stamp (usually hand carved) which in some way relates to the location that the box was hidden in, or the theme of the box. Inside, it should also have a log book where people stamp in their own personal stamp (like a signature that you were there and found the box). The personal logbook doesn't have to be fancy - its just a place to stamp into. Ours is a mini stapled booklet of printer paper. Finding the letterbox near the dumps of Battle Mountain, NV. Its a lot of fun trying to hunt down the letterboxes and then stamp them into your log book. I got into letterboxing through a friend, who showed me a hidden letterbox in a cemetery in San Jose. It was hidden in the gnarly roots of a huge pepper tree, inside of a hole which was just big enough to fit a small tupperware container. Since then, I was hooked, and I try to find letterboxes every time we travel. I've also been trying to find the urban ones too. Putting our stamp in the Battle Mountain letterbox. Usually people hand-carve their own personal stamp, but we decided to buy one at an arts and crafts store because it was kind of a last-minute thing, as we were driving out of Oakland for spring break in Nevada. Our personal stamp is a fish, blowing bubbles! We bought a dark purple eggplant colored ink pad. Once we had this, we were ready to start letterboxing. There are some people really crazy about letterboxing, and have found thousands of hidden boxes. They have also created or 'planted' a bunch of boxes themselves. 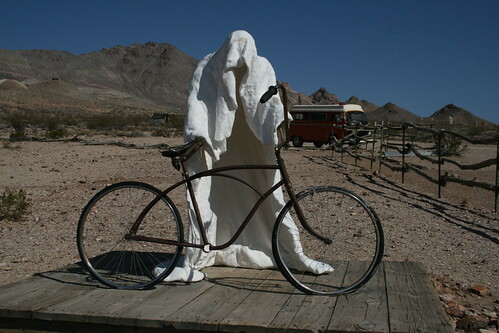 Once day I might plant a letterbox somewhere. . . .
We found the Ghost Rider box in Rhyolite, NV! 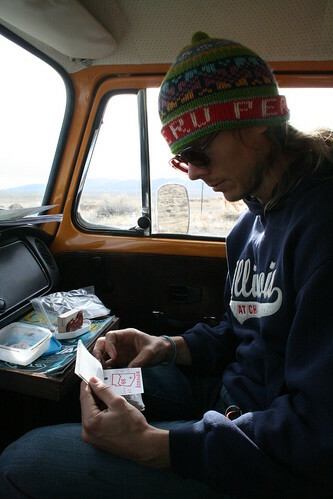 When we were on spring break, we found some letterboxes hidden in the most unexpected places in Nevada. 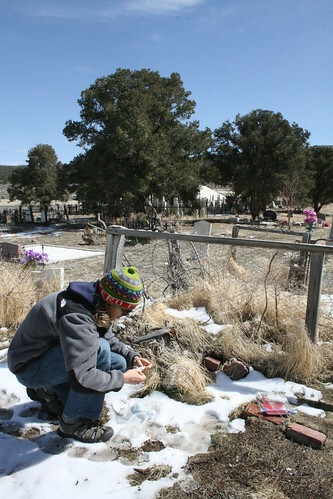 Our first letterbox was hidden next to a grave in the historic Austin, NV cemetery. Another was hidden near the dumps outside of Battle Mountain (sounds lovely but it was cool!). We found another in a ghost town called Rhyolite, and recently found out about so many more that we weren't aware of at the time! It is cool to flip through the log book inside of the letterbox to see how many people found the box before you. We noticed quite a lot of the same stamps in the different letterboxes we found. Someone must of been on the same pursuit before us! This is the Ghost Rider, inspiration for the letterbox theme. Eventually, I would like to hand carve our personal stamp, but for now it will remain the fish blowing bubbles until I have the time and build up the skill for hand carving. So now I have to end this post about letterboxing so that I can get out there and start letterboxing again! We found this letterbox near the gym we go climbing at, Bridges in El Cerrito.